How would we search for homes in a future where tiny homes have become the standard? I've explored this concept in the creating of a real estate search site that one can explore. On the site you can browse various listing to see what types of homes are available and what buyers find important when selecting a new home. This can be see in the types of homes and how homes have specialization due to the limited about of space available. Other information that are important to the buyer can be seen in the various map overlays that give information about access to food and transportation. In this we can also see some side stories that are accurate as some people would fight against the move towards of tiny homes. What are considered normal homes today have become high price luxuries for people who want more space. Or for people who are raising a family and need more space by combining adjacent tiny homes. In this future new services also emerge for people living in tiny homes. A service call Just-in-Time Fridge where perishables are directly delivered to your fridge. This is a necessity for many as in a tiny home people have limited space to store food and full size fridges become a luxury that not everyone will have the real estate for. This could also have other effect of cutting down on food waste but increase in energy spent on transportation of food. Another thing I have considered is how we might furnishes these tiny homes. I've looked at though threw how this will change the way Ikea advertises their products. This is a potential future pop-up mailer that shows of a new piece of Ikea multifunction furniture. With limited space, knowing the space of something becomes important to the buyer to know if it will fit in his home. The pop up helps gives a sense of scale to help with the buyer's decision making. Thinking about how a decrease in our personal space can influence our living. I looked into the concept of tiny homes. I movement about building small self contained homes. These ideas can be seen in the tiny homes movement in the US where people are building their own trailer sized homes that are highly space efficient and highly customized. The can be seen in contrast with capsule hotels that are extremely space efficient and uniform while providing all the basic amenities. Comparing the two we can see two very different paths how this future can turn out. However, some main trends can be seeing. Most importantly, the increase in density. Since everyone needs less space. People start to live closer together increasing the density of our cities. This gives us a lot to think about how people will live is a society like this. How will we deal with the increase in demand for basic utilities? public transport? Storage for the goods we need to live? This creates a lot of side shows that could be present in the world. For example we could see grocery delivery services. Specialized home for specific needs of the occupant to his or her needs. Development of multifunctional furniture specifically for use in tiny homes. To explore this story line. I will be exploring the process of purchasing of a tiny home in this future. I will be creating example of how someone would search for their dream tiny home in the future. 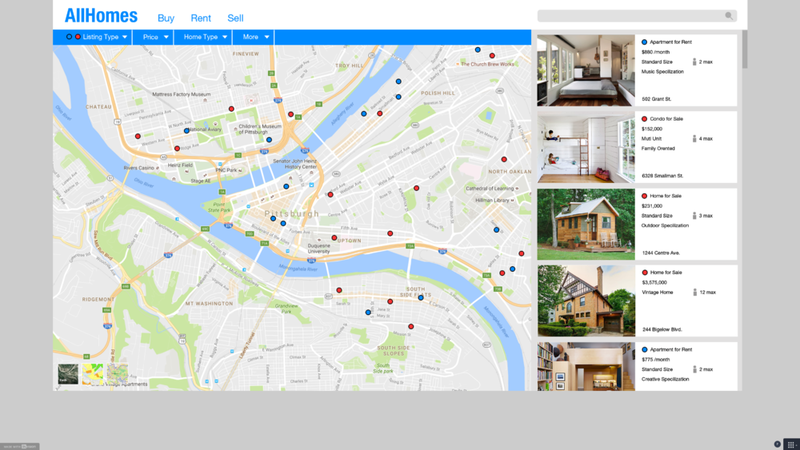 This will include a real estate search tool similar to zillow but for tiny homes. This will provide information that tiny home buyers dem to be important like access to public transport or how close it is located to a grocery story. This can also include organizations that certify various products as tiny home friendly. For example I have mocked an Ikea furniture tag that has a symbol for tiny home friendly certification. Exploring the micro future of better utilization of public transport though shrinking personal space as first saw in the last post, we and try to see how this would fit in to people’s lives today and how it can steer the path of futures by trying to see what potential consequences are. We can do so by examining the micro future to look for the potential side-effects and side-shows. Looking at the futures wheel we can organize some of the potential side-shows that can accrue if this micro future was widely adapted. This micro future is a societal behavior change and poses many potential side-effects both positive and negative. For example, public transport will be able to transport more people but can put these people at greater risks of theft. This could also have other issues with people wanted to opt out as it might be too uncomfortable for people or because of certain tasks people need to do are incompatible with public transport. The increase in public transportation usage will lead to a decrease in demand for personal passage vehicles. The can cause a major downsizing of the car industry that effects the well-being have thousands of people involved in the design, manufacturing, and maintenance of cars. With decrease in car demand follow with it decrease in demand of gasoline. We will have surplus in gasoline production causing a crash in the price of gasoline that many people are already having a hard time with. The shrinking in personal space can result in increase in density around major urban areas. This could also drastically change the way we design our urban areas from the current car centered design to a public transport centered design. I have looked a four possible micro futures. Public transport in Asia, Toothpaste maximizer, Velcro spice rack and Food caddy. This photo is a scene of the Tokyo train system during rush hour. People are squeezing into the train, packing as many people onto the train as they can. The sense of a physical personal space is completely gone with contact to other travelers on all sides. This seems to be a trend across most of Asia where people are willing to pack in and get a lot closer to others on public transport compared to their Western counterparts. This is something I see my parents do. To get all the toothpastes out of the tube they will fold the bottom of the tube as they go and use a clip of some form, in this case a bulldog clip, to help squeeze every last drop out. I've learned from my dad that this is something he learned to do from his father. This is something I do myself. 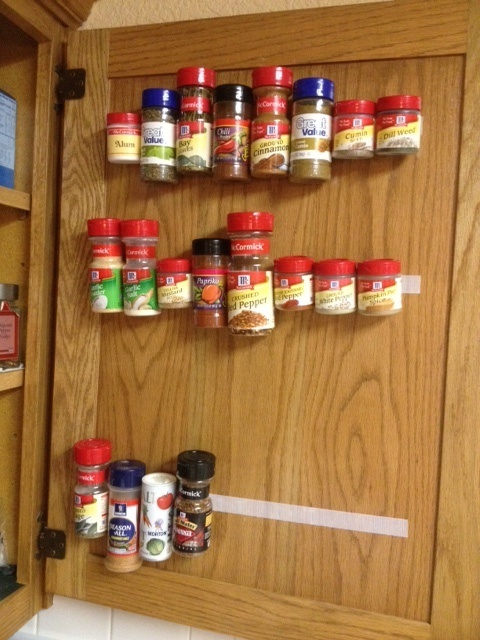 Being someone who cooks a lot, I have collected a lot of spices over time. Storing all these spice on shelves is not optimal as thing start to get hidden in the back making it hard to find things or forgetting about them causing the purchasing of spice that I already have. By putting velcro on the cabinet door and the bottles. The spices can be stored in a way where they are all displaced and non of them being hidden in obscure places. This seems to be a uniquely American thing. Long drives and fast food are part of many people's lives in the US. One of the problems that arises is what to do if you need to eat during your drive. Having a beverage during your drive is normal with cup holders in every car now, but what about food? this person uses a shower caddy that are designed to hold your shampoo and soaps to hold her burger and fries. Everything stays organized allowing the user to eat and drive at the same time while minimizing taking one's eyes of the road. A blog for Brian's work, working progress and some other stuff.